Raitha is an accompaniment usually served with any spicy dish. Raithas like cucumber raitha or onion raitha go well with dishes like biryani, parathas, or any rice variety. I prepared this raitha to go along with the huli kootu. 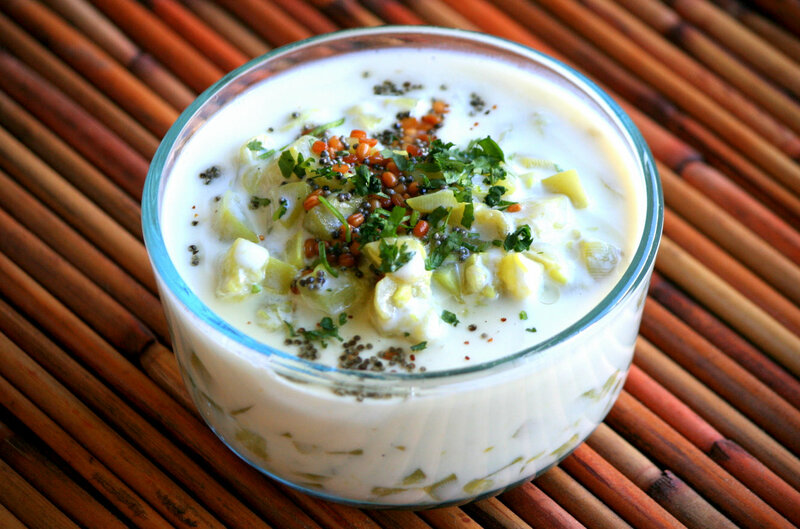 A very easy reicpe where the bottle gourd/sorrakkai is diced and cooked and later seasoned. Here is the recipe. Peel the bottle gourd skin and dice the vegetable. Grated bottle gourd can also be used for this recipe. Heat half a cup water in a kadai and add the vegetable, mix salt and cook in medium heat. Very less water is added as the vegetable by itself will leave water when cooked. When the bottle gourd is completely cooked, turn off heat and allow the content to cool for about 15 minutes. Heat oil and add mustard seeds, when it pops, add the urud dal. When urud dal turns golden color, add the seasoning to the raitha. Garnish with coriander leaves. Adding slit dry red chillies to the seasoning is optional. Serve this raitha for any sambar rice or huli kootu rice as an accompaniment. Loving it... bottle gourd will impart a subtle taste to the awesome raitha... yumm..
healthy n innovative raitha! !nice click!